KEY CONCEPT: Exploring the concept of time. DESCRIPTION FROM THE PUBLISHER: The zany CATegorical cats introduce the measurement of time, from seconds, minutes, and hours up to decades. 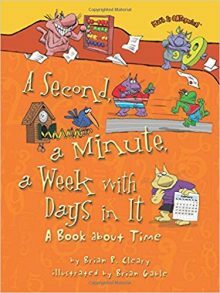 Brian P. Cleary and Brian Gable bring their winning teamwork to this playful, fun look at learning about time.